I Got a BIG Surprise Last Week!!!! That's right - a BIG, really BIG surprise!!! I mentioned before that Lizzy got engaged at Christmas, her plans were to get married on the beach in San Diego on June 6th, 2015. Well, she started to change her mind and thought maybe she would do it in town instead. We were all happy about that change - only because it makes the planning easier. So last Thursday her and I had an appointment at a venue to talk $$$ and as I was looking at the proposal I realized there was a typo - it said June 7th 2014. We had a little break and I asked Liz if she had noticed the mistake and she ever so calmly said to me "Oh Mom, didn't I tell you? I changed the date." this was fine with me until I counted on my fingers how many months we had to plan, execute and fund this wedding. . . It is only FOUR months away!!!!! Needless to say we are in full wedding mode around here right now! I thought I'd show you some of projects and messes tonight. 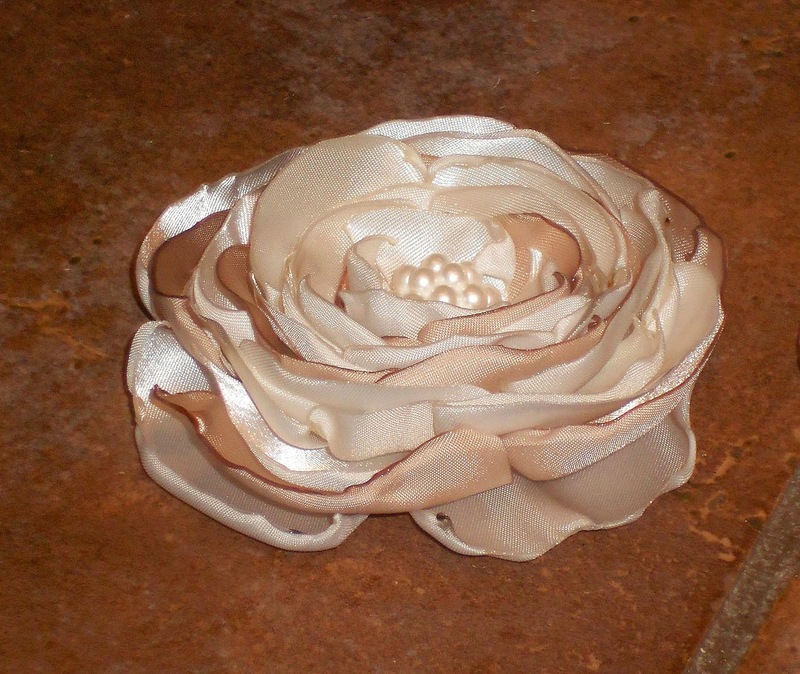 . .
Liz wanted handmade fabric flowers for her wedding similar to these here. 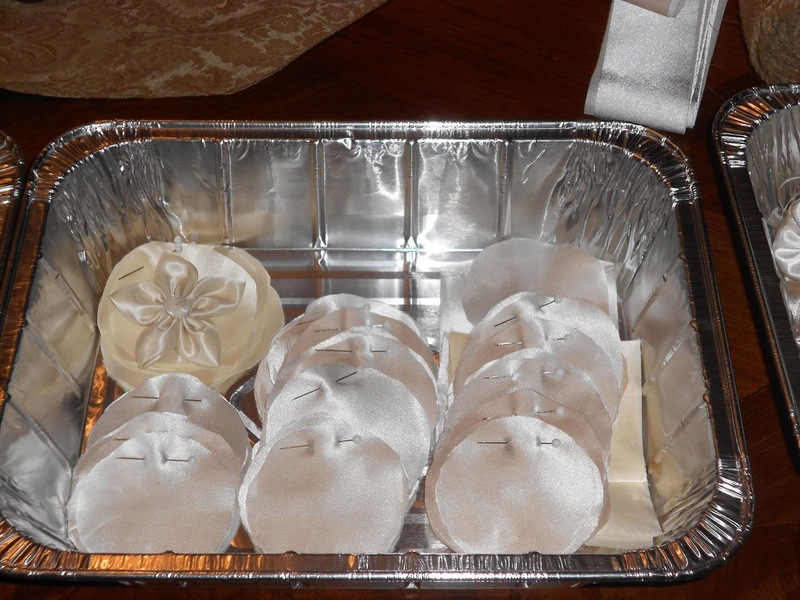 I told her I could make them for her and use some of the satin and lace from my mother's and my wedding dresses. Of course when I said this I thought I had a year to make 6 bouquets! 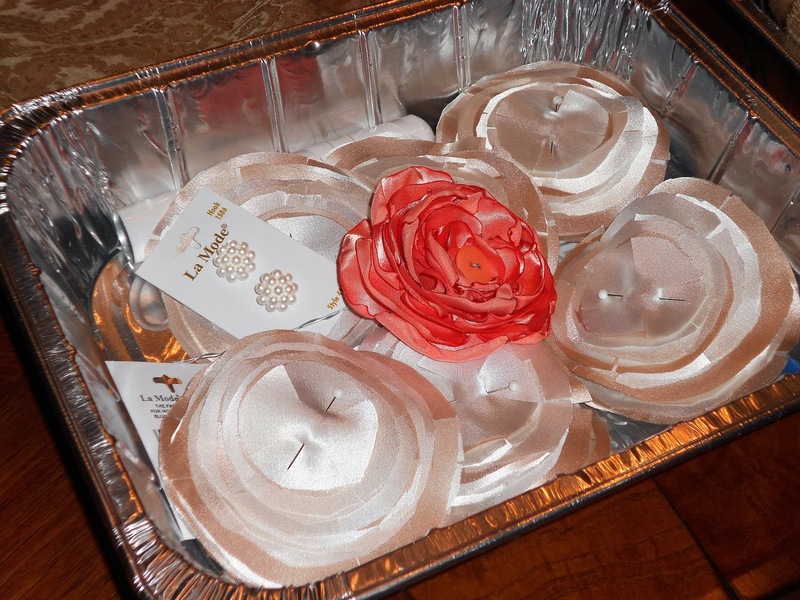 so my dinning room table is full of foil pans filled with fabric petals to make the bouquets. I have almost all of cut now and even have a few flowers in different stages of doneness (is that a word?) you can see some of that mess below. 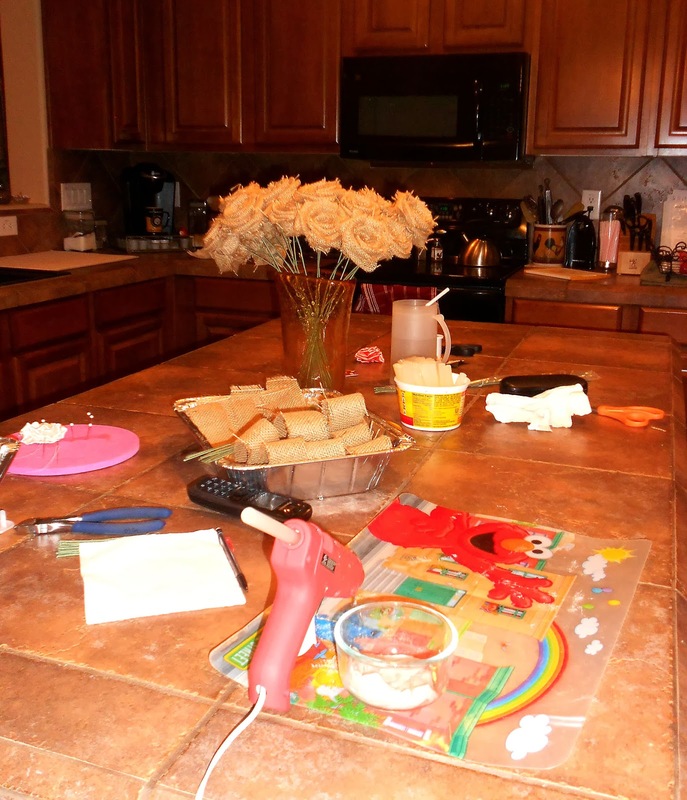 I have even taken over the kitchen counter work on the flowers. . . These are the different types of flowers we settled on - I made about 12 different styles of flowers out of scraps of fabric I already had and Liz picked the ones she liked best for her bouquets. 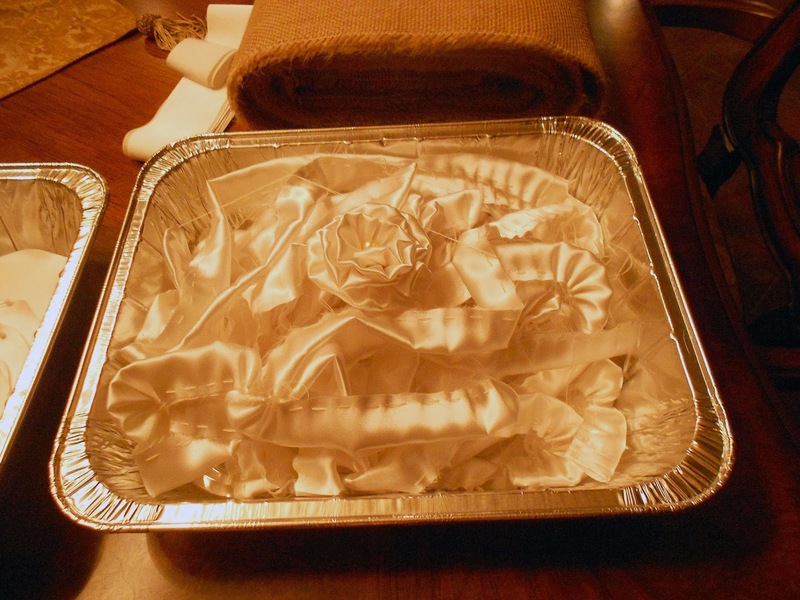 It is made out of an ivory and taupe satin and will eventually have some lace from my wedding dress and some pearls in the center (as well as a stem) To get the curly edges you need to use a lighter. My thumb is already killing me! This is the pan with all of the cut outs waiting to be torched and put together. The peachy flower in the pan is just my sample I made for Liz. I don't know what type of flower this would be in nature - but we are calling it the curly satin flower around here. 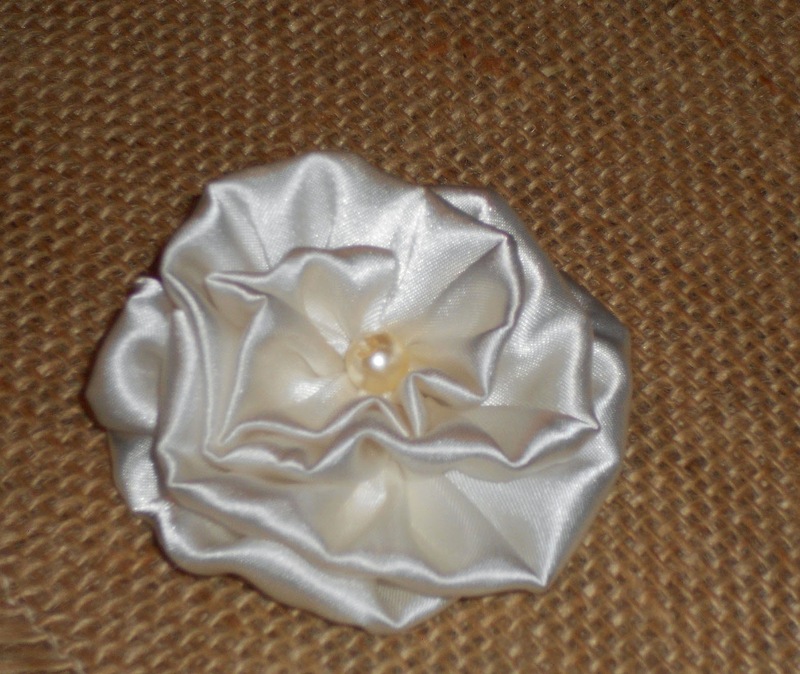 Obviously by the name it is made out of ivory satin with just a single large pearl in the center. Lizzy's will have a pale pink pearl in the center. I got 23 out of the 30 done last night!!! Another fancy name for this one - we are calling it the star flower. This one is made out of my Mom's weeding dress and the button center is off of the sleeves of her dress. 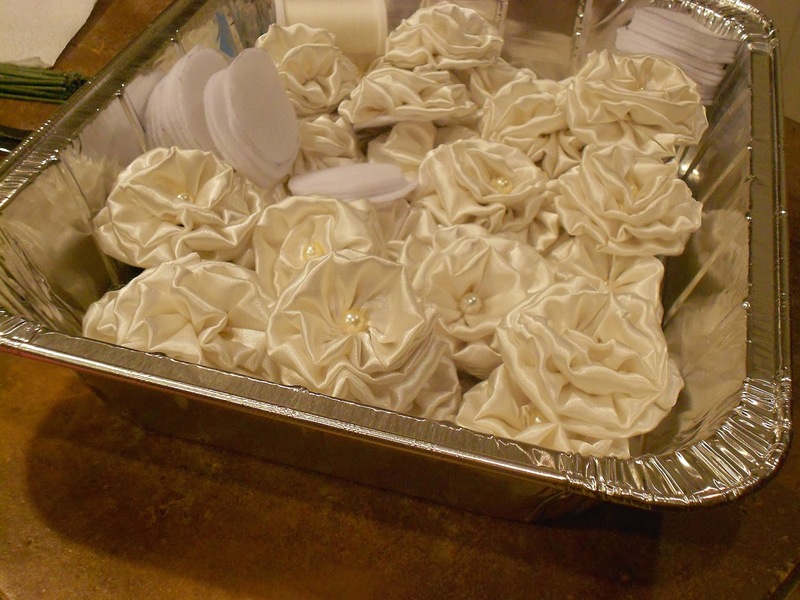 The bride's maids and the toss bouquets will have satin flowers and store bought buttons. Only Liz's bouquet will have the ones made from Mom's dress. 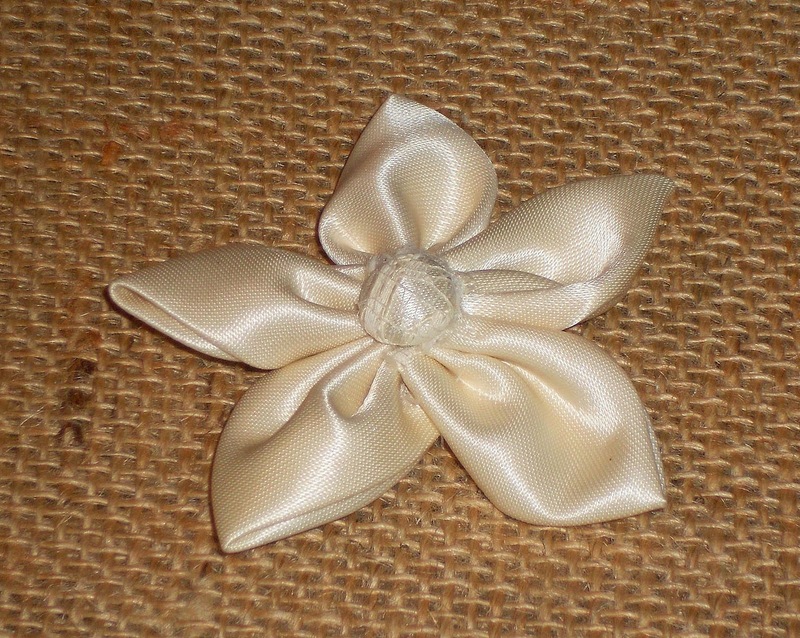 This one has been named the carnation and is a simple tulle and muslin flower with some pearls in the center. This is a super easy one to make - I just need to get the circles cut. It takes 10 muslin and 9 tulle circles to make this one. Cutting those circles takes a long time. Thankfully Liz has come over twice to help cut. As you can see I only have a few cut so far. 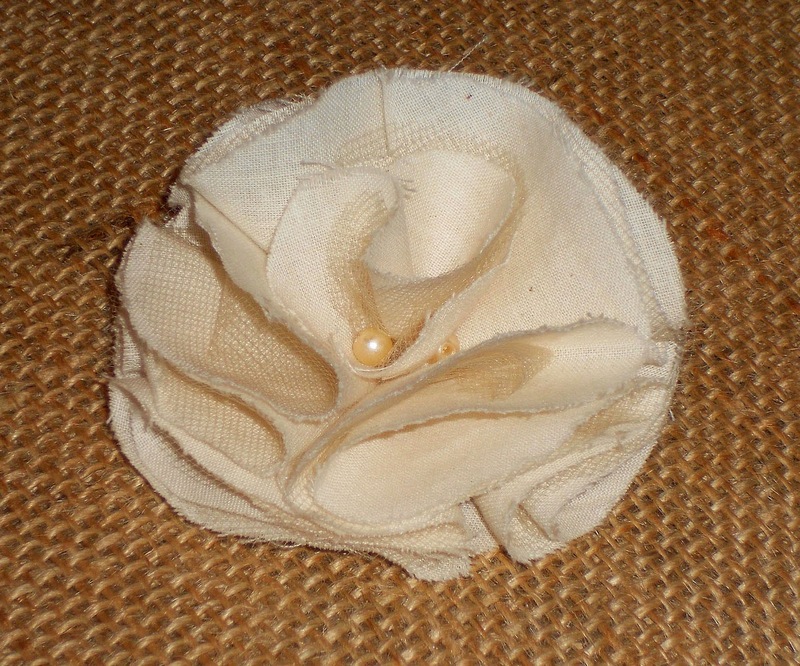 Lastly we have the ever popular burlap roses. These are also quite easy to do - I got 20 of them done today! 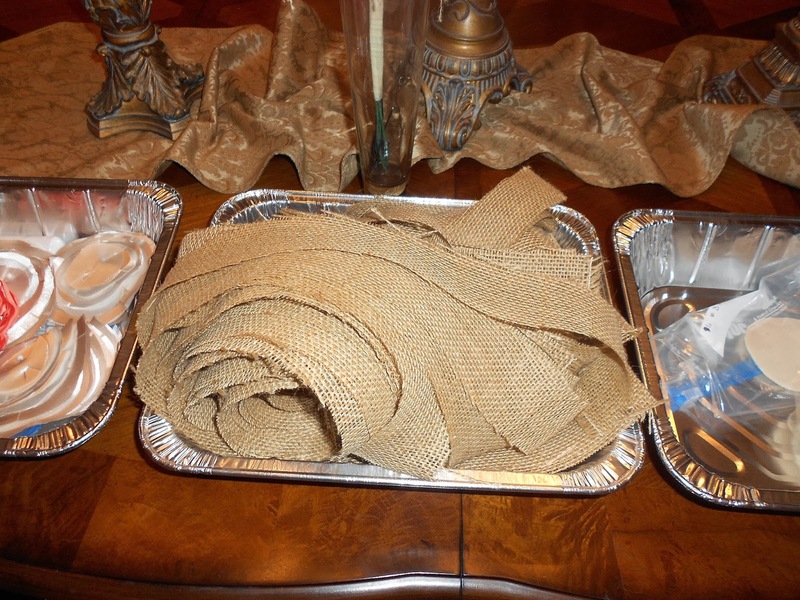 I was so glad that Lizzy was willing to cut all of these stripes of burlap for me the other night! 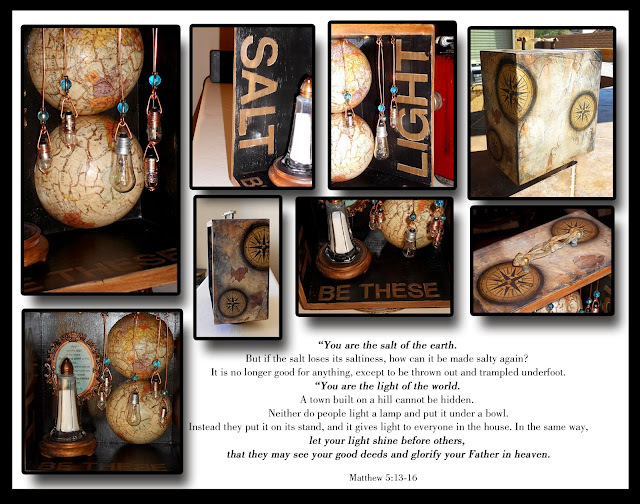 I still need a few more - maybe tomorrow night when she stops by. . . .
Liz is doing a shabby chic, burlap & lace themed wedding so I have a huge bolt of burlap sitting in my dinning room, mason jars of all sizes and colors stashed where ever we can find a home for them. 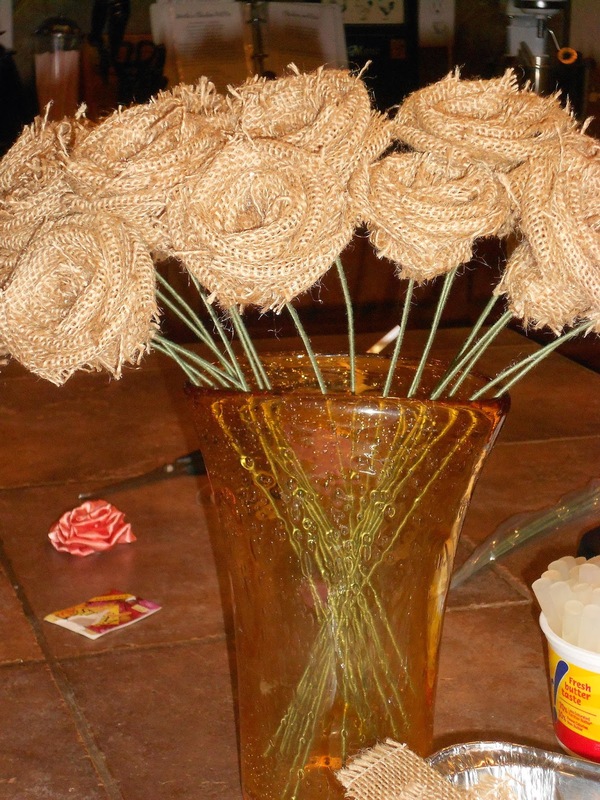 When I finish with the flowers I will be making burlap table runners and wrapping the lids of the jars with jute twine. I am also making the guest book out of . 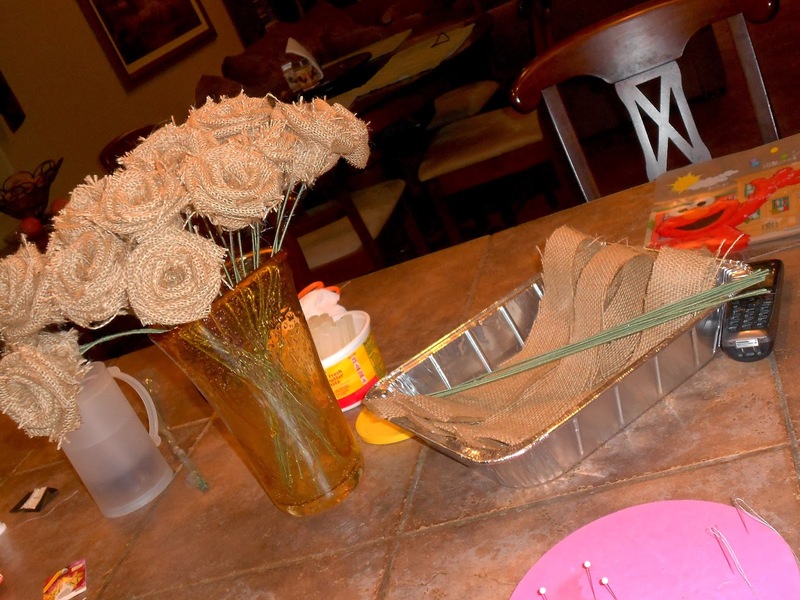 . . you guessed it, burlap & lace and a couple handmade flowers. 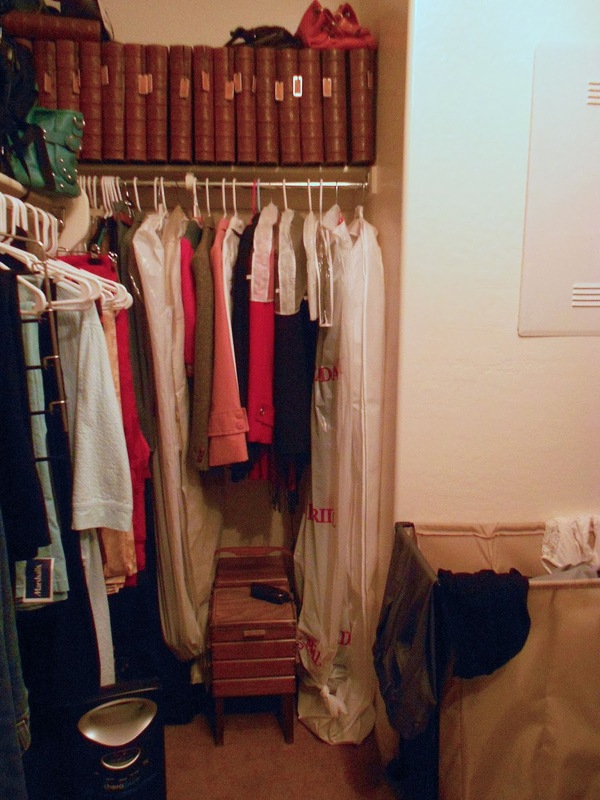 Also in my closet is a wedding dress and a Mother-of-the-Bride dress. Yeppers, we have them already. Liz picked hers out and ordered it the day after Christmas. And I just found and purchased mine last night. This was not the dress I originally planned to buy but I saw it and tried it on and the girls just loved it. Sadly it only came in black - but Liz was okay with me wearing black. My camera was having fits so it is hard to see it but it is all lace overlay with sequins from the waist down and satin from the waist up. I gotta get a tan before June!!! This my Monkey in the dress we ordered for her last night - I couldn't get a picture of bug in hers or the girls in their bride's maid dresses. So just when I said I was committed to being more regular with my blog I ended up being gone for 10 days. Hang in there with me - I will try to be around and share some of the stories, projects and messes that I encounter over the next four months! My FIRST Class of 2014 is Ready! I have not taught a class since July! I have taken a nice long break and am now feeling rejuvenated and ready to share with all of you gals again! I hope you will like what I have for you in this first class . . . 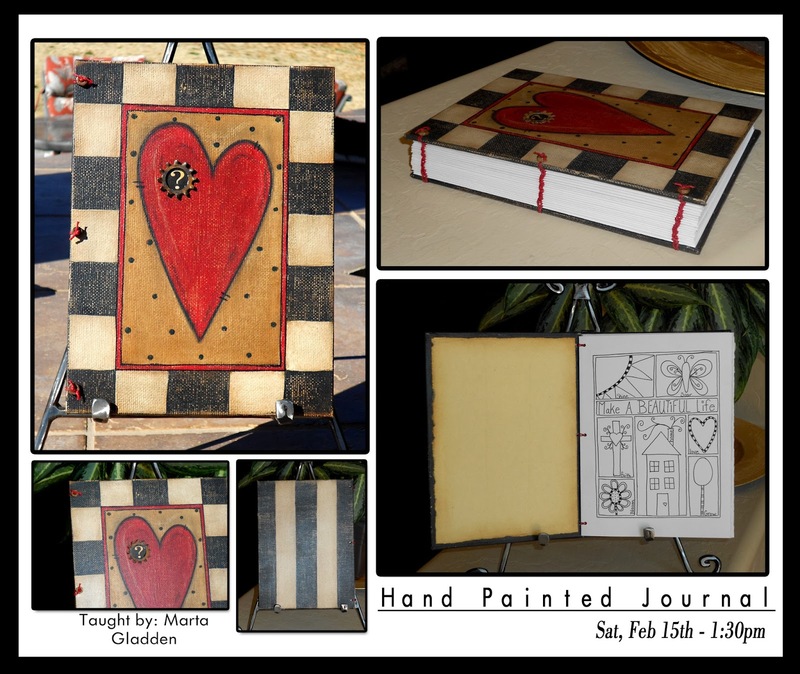 It is a 6x8 hand painted journal/sketch book. It is filled with 20 pages of my favorite drawing papers and it's bound with a slipknot stitch. 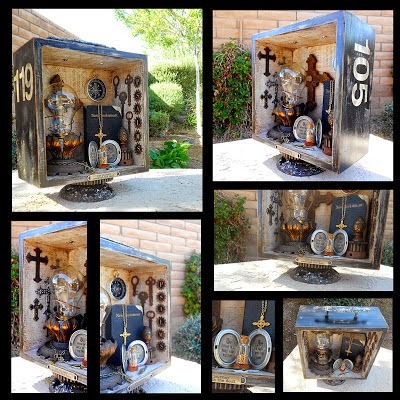 The covers are made from artist canvas boards and of course it has a couple rusty elements on it! It lies open nice and flat, perfect for writing or drawing. I have already filled the first 10 pages with doodles! The sample will be at The Occasional Artist on Tuesday afternoon so you can start signing up any time! I hope to see you there ready to create! 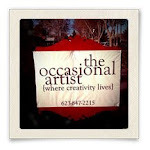 Holiday Happenings. . . . 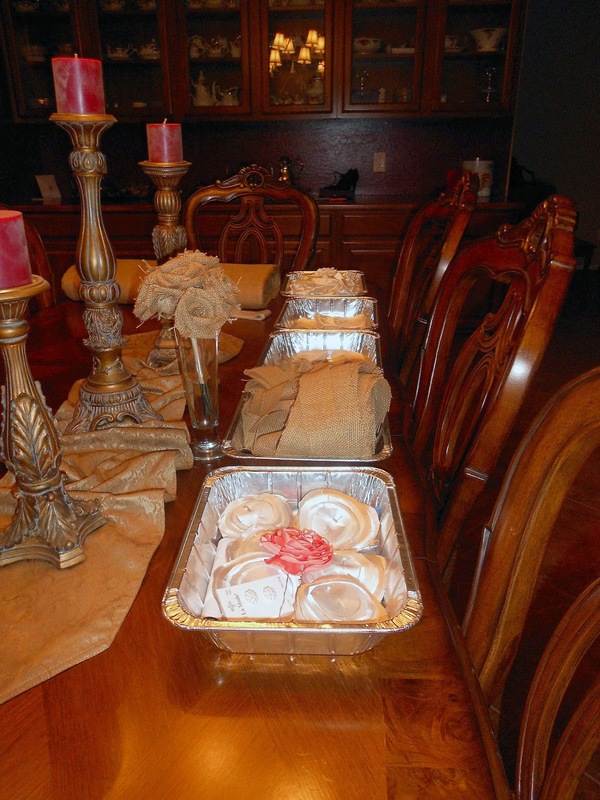 Since I was "gone" so long and have now promised to update what I did while I was "away" I am going to chat it up about the holidays at the Gladden Casa. But first - how was YOUR Christmas??? Our Christmas started off with a surprise celebration. 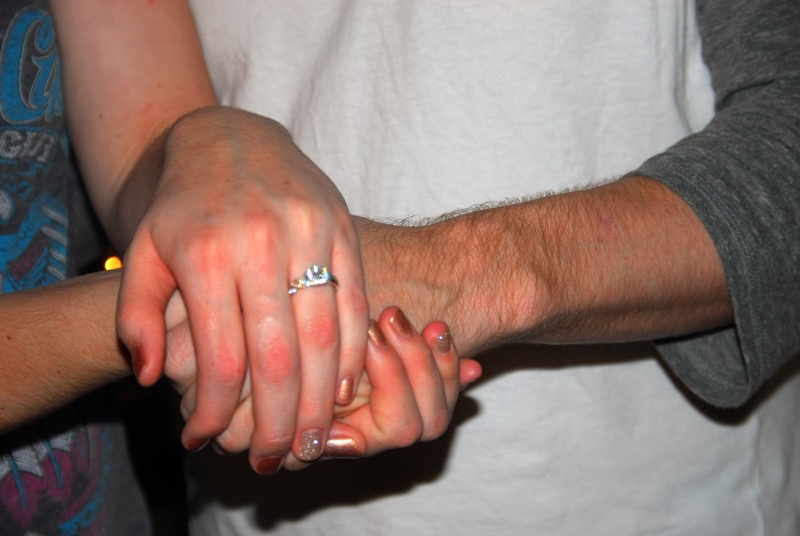 On the 23d, Richard purposed to Lizzy and it was very romantic how he did it. He took her to all of the places that have had some meaning to them throughout their 9 years together. They went bowling (their 1st date) went to his Mom's old house (where they spent so much time and where he told her he loved her for the first time) and lastly to Tempe Lakes where they spent their 1st anniversary. 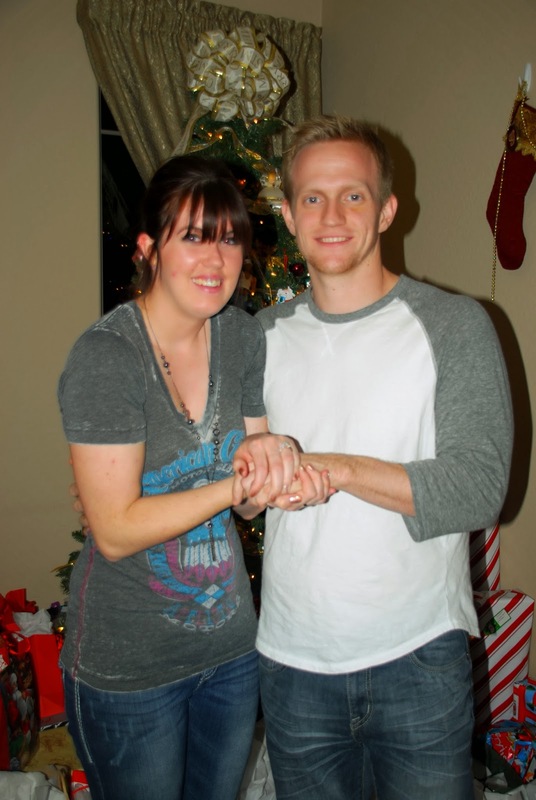 This is where he finally popped the question, down on one knee with a ring and everything. I guess there was a lot of crying and then Lizzy begged him to bring her home to tell us. On the way to our house he reminded her that she had not said yes yet. There were lots more tears once she got here. Her ring is beautiful and she is so happy! We had a wonderful Christmas here. The Grandkids were in heaven and loved all their toys and all of the munchies. They were so sweet, London opened a box and there were batteries in it and she clutched them to her chest and screamed "I have batteries!!!!" right after that she opened the gift that she needed the batteries for, but it didn't lessen her joy over the batteries. Kids are so darned cute! The girls also got a car for Christmas. . . The day after Christmas us 3 girls (Bryanna, Lizzy & I) went out for lunch and then to go look at Mother of the Bride dresses (their idea), I found 2 that I really like and that the girls both liked. 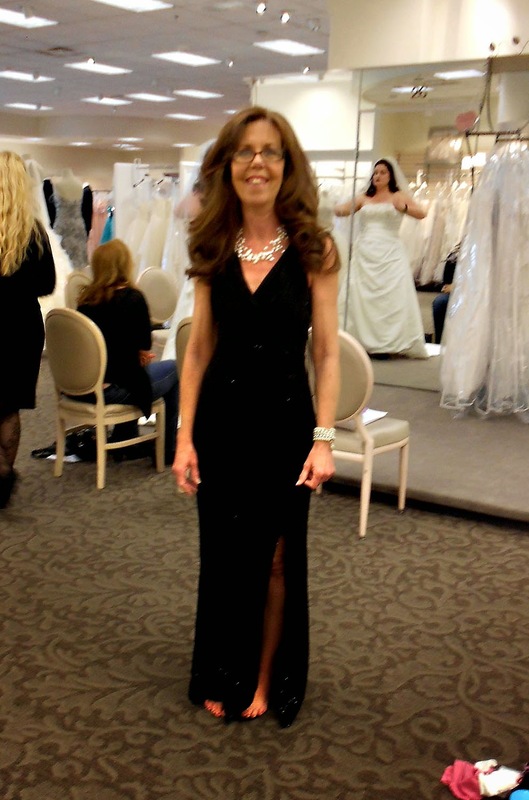 Then we decided to just take a peek at the bridal gowns and next thing I knew we were heading back home to get my Mom (Lizzy would not try on any dresses without Grandma there). 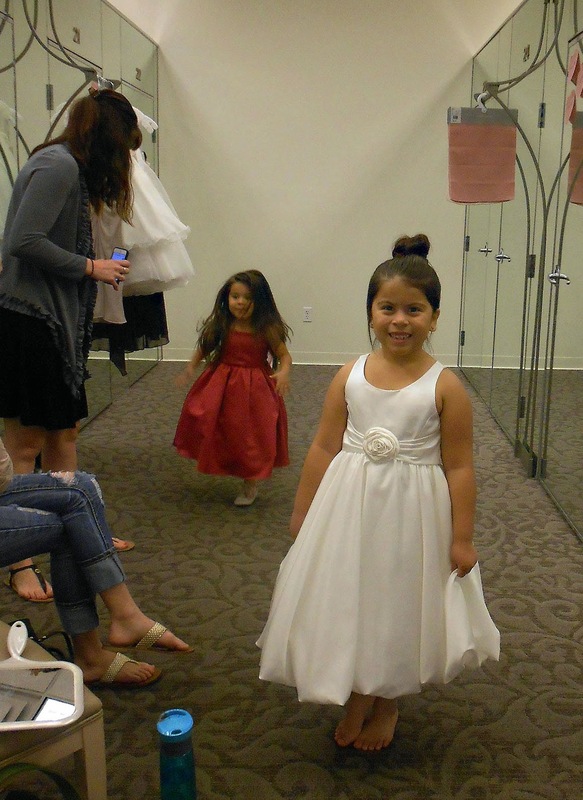 After trying on several dresses she found THE ONE! We ordered it that day and it wasn't supposed to arrive until May but is now hanging in my closet! 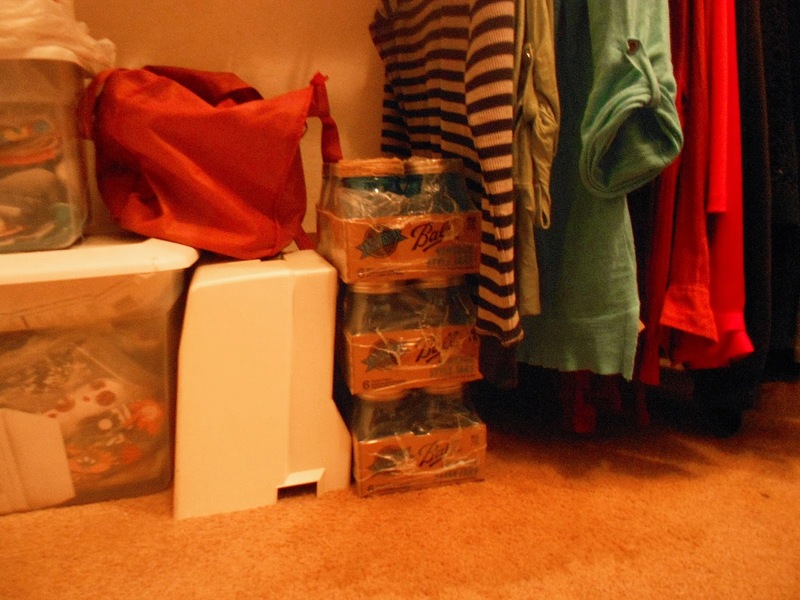 The wedding is not for over a year - I guess I need to get my closet cleaned up so it doesn't get smooshed in there. And I gotta share my Favorite Christmas gift this year - it came from Gary, although the girls helped him shop. . . 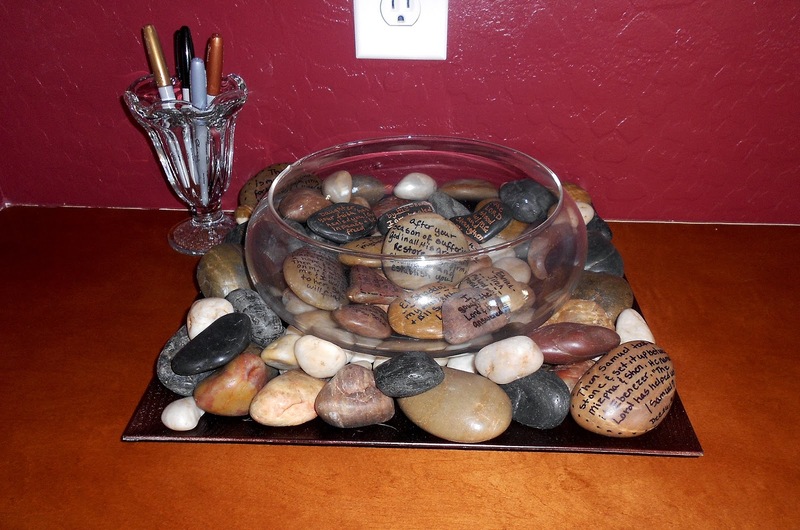 Okay, so it's more than just a bowl of rocks to me. I actually asked for this and nothing else for Christmas. Here's why. . . I have been having some ongoing dental issues and frankly don't have the $15,000.00 to fix the problem. And yes that is really $15,000.00! So back in Nov I woke up and had a really bad abscess in my mouth and somewhere I needed to be. My mouth was really hurting and more than that it really scared me. I started praying and really pouring out my heart to God and sharing my fears about the whole situation. Then I had to get showered and dressed and turned on the tv. There was this preacher on and I didn't really want to listen to him but I did it anyway. It was amazing - it was as if he had been in the room with my while I was praying! That night they were replaying his broadcast and so I made it home in time to watch it and take notes. Since then I have been doing a really interesting study on the scriptures he used (Mark 5:21-43, about the woman with the issue of blood and Jairus' daughter) and also studying some of the names of God (Jehovah Rapha, Shammaw, Jireh and El Shaddai). This all lead me to start writing things on stones that God was teaching me. This then led to me trying to find how I wanted to keep my rocks and display them. 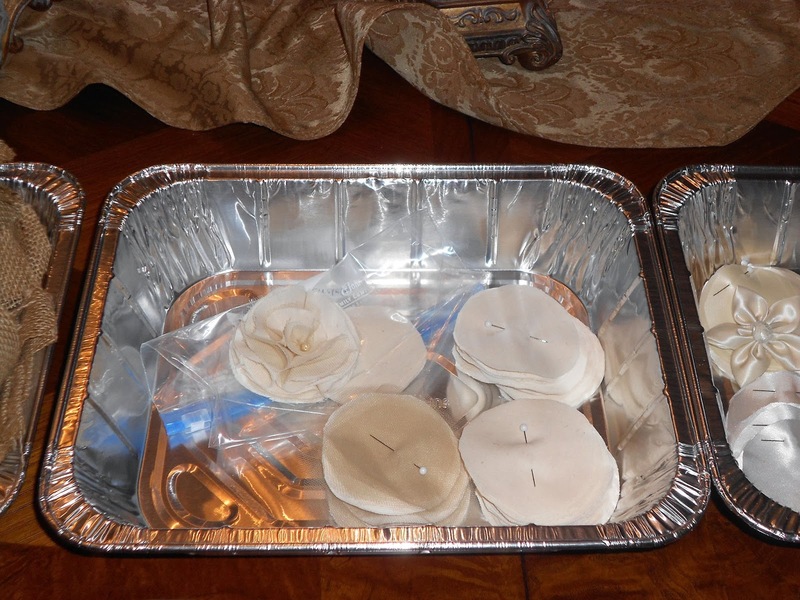 So of course I went onto Pintrest and I found how I wanted to store/display them and asked for the supplies for Christmas from Gary. Also when I found the idea for displaying my stones they called it an "Ebenezer" and referred to the Bible. I wasn't familiar with this name/term so I looked up "Ebenezer" in the concordance and found the scripture in 1 Samuel 7:1-12 it means "stone of help". 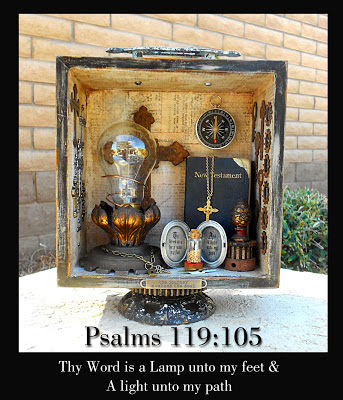 Are you familiar with this scripture? 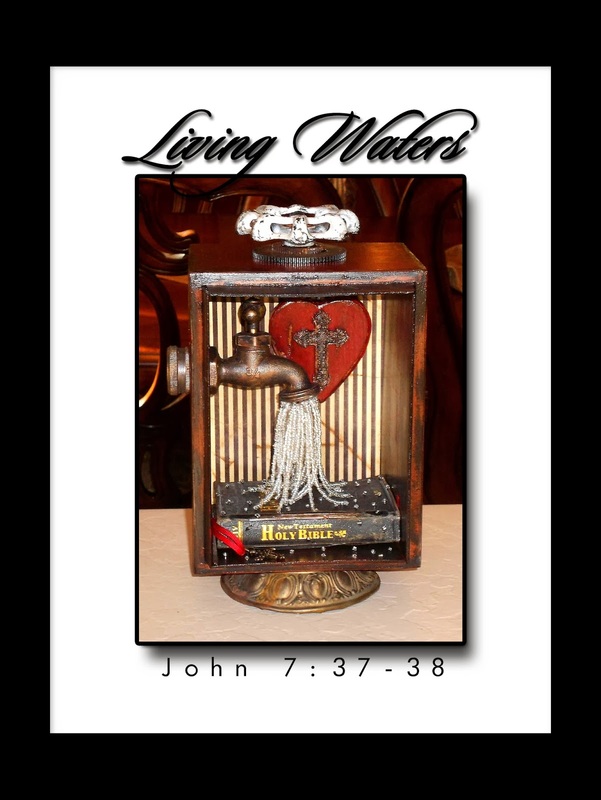 The Israelites were returning to the Lord with all their hearts and had given up their idols and confessed their sins to God. Samuel had told them all to go to Mizpah. Then the Philistines planned an attack on the Israelites. When the Israelites got word of the planned attack they were afraid and asked Samuel to continue to pray to God on their behalf. Samuel continued to pray and made a burnt offering to the Lord. When the Philistines made their attack on the Israelites, God intervened and the Israelites slaughtered them. Then Samuel set up a stone (Ebenezer) between the two cities of Mizpah and Shen as a reminder of how God had once again helped them. This was only the beginning of their deliverance from the Philistines, but the stone offered them hope and encouraged them that God would indeed complete their deliverance from their enemy. The Philistines restored to the Israelites, the lands they had taken from them and stopped invading the Israelites territories. The hand of the Lord continued to be against the Philistines throughout all of Samuel's life. Okay so I am getting ready to make my "Ebenezer" (write on my stones and put them in their container) Thursday evening after bridal shopping and I start studying this story more and guess what God revealed to me? I couldn't make this stuff up my friends! So the town of Mizpah means "The Watchtower" or the "Watchman". It was a place of security and of peace, where the people were accustomed to meet in great national emergencies. Samuel gathered Israel to Mizpah for prayer in the light of the Philistine threat There, in deep humiliation on account of their sins, they renewed their vows and entered again into covenant with the God of their fathers. It was a period of great religious awakening. David also moved his parents there for safety during his persecution by Saul. So, all of that to say - I believe that I am to be "living" in "Mizpah" (a place of security and peace as well as spiritual renewal) and my Ebenezer (”Stone of help") is standing between where I am and my teeth that are rugged, rough and broken! I am constantly amazed at how personal God is with us through His Word and how many mysteries there are in His Word if we just take the time to look for them and to listen to Him! It is also kinda fun that Gary is now excited about his gift to me - he didn't really "get it" when I asked for it. He asked if he could also write his prayers etc on my stone. 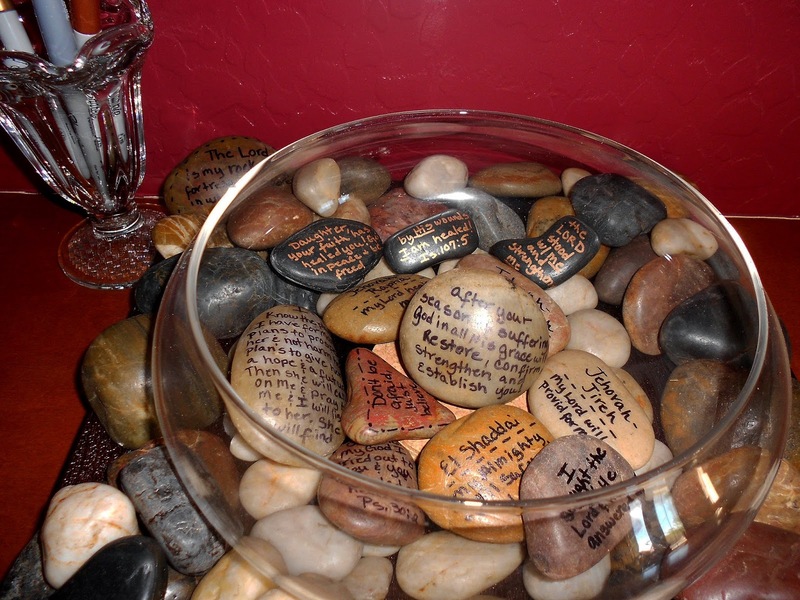 I of course told him yes - anyone is allowed to grab a stone, write their prayer on it and through it into the bowl. Well, I have another bridal appointment in the morning so I better say goodnight. It's So Nice to be Missed! I got a short, but sweet email the other day. . .
missing you and wondering if you're ok!!" It made my day to know that someone out there missed me. I have been wanting to come and update the blog for quite some time now and this email was just what I needed to get me going. So here is a short update on what's been going on and a little Show & Tell about a couple of projects I have been working on. I found myself taking an unexpected sabbatical from just about everything outside of my own home and family. Nothing at all wrong, I think I just needed to recharge. Then as my sabbatical got longer and it got harder to get back out there. I do have some more posts ready for my blog so keep an eye out for those. I figured it would be better to spread out my update than to make one really long post. I am trying to come up with some class stuff too. Sadly most of my latest ideas for classes have been flops. But I will keep trying. And here are my latest projects. . . 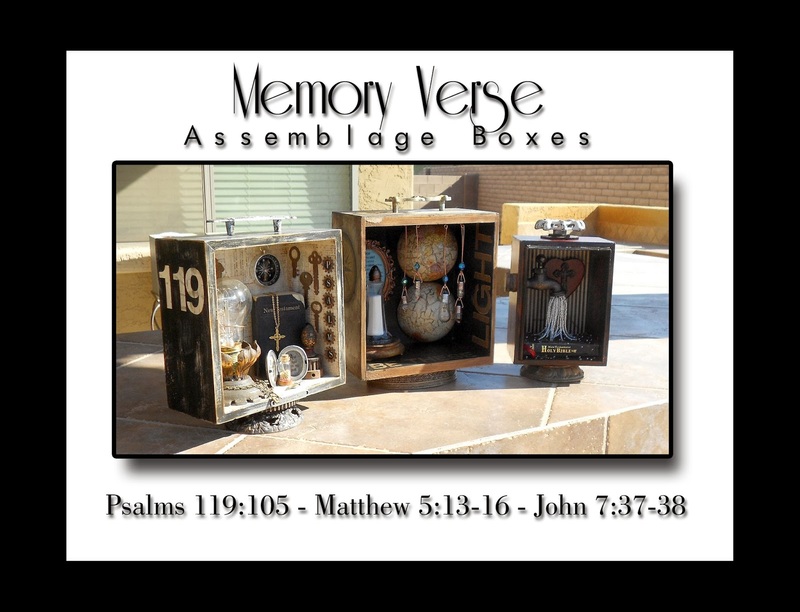 I am working on a collection of Assemblage boxes that will all be based on Bible verses that I memorized as a kid and that have become meaningful to me over the years. 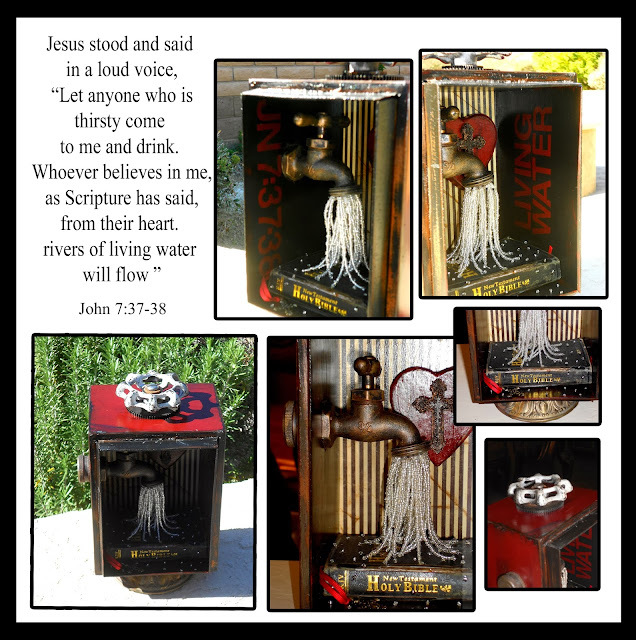 My hope is to enter some art shows this coming Fall and sell some of my art work. So I am trying to get several pieces done for that. I am really enjoying the process and loving how God is bringing His word to life not only in my art but in my heart! These are the first three boxes in the series. Here you can see some of the details on the piece. I have to admit that my Mother was a huge help in stringing all of those seed beads! And of course you can see all of the details here. 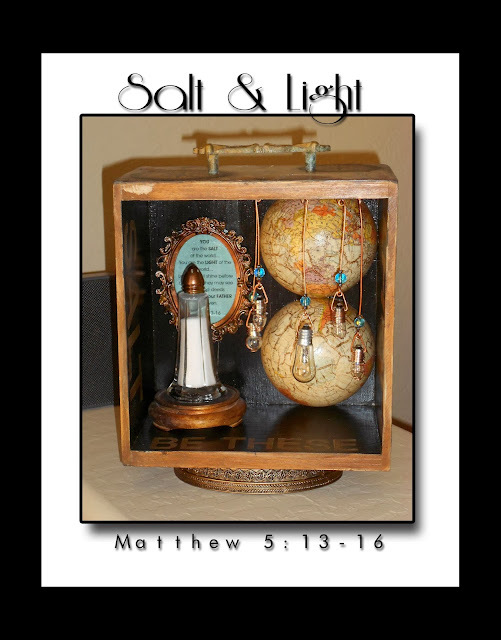 I really love how the finish on the outside of the box turned out and I love the little light bulbs hanging from the beaded copper wires. I hope you enjoyed seeing a little bit of what I have been up to since we last got together. I will post again soon with some of the exciting news that happened during our Christmas holiday.